This is my neighbor's recipe. Hands down the best pie I've ever made was using this recipe and the apples and cranberries I got in northern Wisconsin in the fall. This is affectionately known as "crapple pie" in my family. GF* - To make this gluten free, use gluten free pie crust. I used the Glutino pie crust mix. 1. Bring cranberries and juice to boil and simmer 3 min. 2. Slowly stir in sugar and cornstarch mixture and cook about 2 min. until thickens. 3. Stir in sliced apples. 4. Fill crust and top with second crust - make design if desired. 5. Bake at 375 for 35-40 min until the crust is light brown. This tastes great served warm with vanilla ice cream, but it also great cold straight out of the fridge! 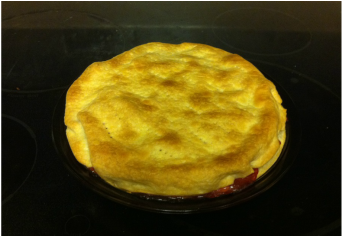 This pie is really easy to make ahead and reheat in the oven before serving. Be sure to bake this pie on a cookie sheet, as it tends to drip.